If you have you ever lost your child, even for a moment, you know that it is every parent’s worst nightmare. And it happens to 90% of all parents. SafetyTat® – "The Tat That Brings Kids Back! 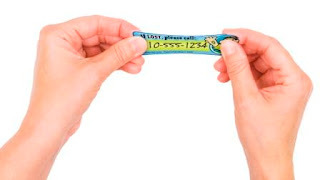 "™ – inventor of children’s safety tattoos featuring a parent’s mobile telephone number to easily reconnect parent and child in the event they get separated, has just made a brilliant invention irresistibly convenient. 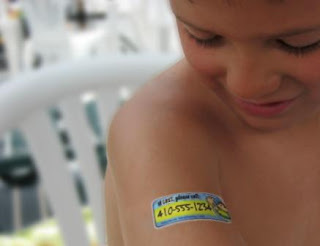 SafetyTat’s new line of children’s safety tattoos -- Quick-Stick Write-on!™ tattoos -- are the ultimate convenience. These safety tattoos are applied without water so they can be used at a moment’s notice anytime parents are with their children in a crowded place. And, unlike many tattoos, they won’t rub off! Customizable on-the-spot, a parent simply "Writes-on" their mobile telephone number directly onto the tattoo in the space provided creating an easy way to reunite a parent and child should they get separated. What’s the secret behind this innovative tattoo? — Tateck™. micro-thin elastomer that is applied like a sticker to the skin—simply peel and stick. breathable material that is opaque in color making it highly visible and readable. "Tateck is simply amazing. We have worked so hard over the past year to develop this durable easy to apply material to make safety convenient and easy for parents. If it’s convenient, more parents will use it and we will have many fewer traumas associated with lost children," says Michele Welsh, Founder of SafetyTat and mother of three young children. Law Enforcement Professionals praise SafetyTat’s line of tattoos. "I see SafetyTat as important to parents with young children as are seatbelts in their cars or smoke detectors in their houses" said Tom Rice, Retired Superintendent and Colonel of the Ohio State Highway Patrol and Federal Security Director for the Department of Homeland Security. As a recent winner of the iParenting Media Award for Hot New Product, it’s no surprise that parents and kids love these Quick-Stick Write-on! tattoos as well. "This is a no-brainer. I keep them in my wallet at all times…this added safeguard gives me more peace of mind" said Mike Masucci of Columbus, Ohio. Quick-Stick Write-on!™ tattoos come in a design for Boys or for Girls. And the best part about them -- kids love to wear them! 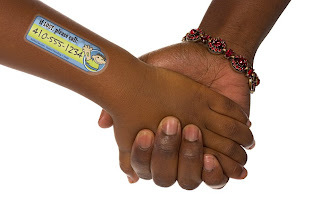 SafetyTat temporary tattoos are perfect for any crowded venue where a parent and child may get separated: shopping malls, airports, traveling, theme parks, water parks, field trips, , stadium events, site-seeing, beaches, pools, etc. SafetyTat carries a full line of Quick-Stick Write-On! and Original Tattoos. For Safety that sticks, Stick with SafetyTat. Thankfully, I haven't had to use these yet. But, it's summertime and we're planning a couple of trips: one to Ocean City, Maryland, and one to Six Flags America in Largo, Maryland. These will come in handy at those venues, since they're always PACKED! I will be taking my SafetyTats on these trips! You just never know! These are a great, ingenious product and I'm proud to say that the SafetyTats company is based in Maryland! 3 Lucky winners will win a pack of Quick Stick Write-on Tattoos. To enter, head to the store and browse around, then come back here and enter in the form your favorite kind of SafetyTat! Remember to stop by Moody Mama Says and Everyday Baby Steps to enter their giveaways!